Pat French and Kris Schnack, co-owners of the new French Press Catering business, said they felt Eau Claire was the perfect location for the restaurant because they are both locals and know the community well. “We want to feed the community and make them happy, and our food is going to make everybody happy,” French said. What makes their restaurant special is the selection of food they offer, she said, including breakfast and lunch items and a wide variety of coffee, espresso, and tea. 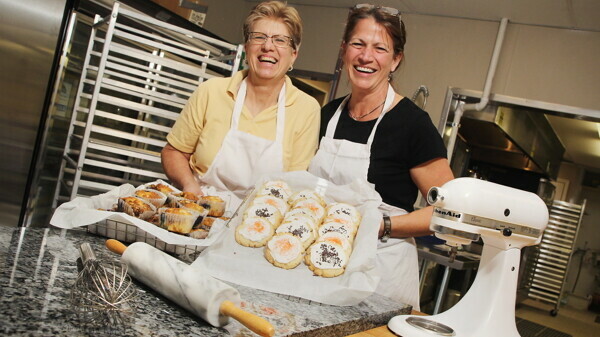 In addition, they said all of their bakery items are homemade and most aren’t sold in the area. “We have a lot of interesting bakery items that really aren’t being offered locally from scratch,” French said. While they have a set menu, French said they also have daily specialty items that rotate throughout the week. There is also a “little people’s” or kid’s menu available. Whether you’re in a hurry or have time to spare, Schnack said there is room for everyone and they hope to attract all sorts of community members. “You can come in and you can get anything from a breakfast sandwich to a full breakfast with potatoes and sausage if you want,” she said. The restaurant provides a friendly atmosphere, French and Schnack said, as well as a place where people can come in to relax for their meal or grab a quick bite and go. Currently, she said they are doing a couple of catering jobs a week while undertaking the remodeling of their new restaurant.During the remodel, they added a separate space for a meeting room, where groups and companies can sit down and enjoy a meal while talking business. After their business is up and running, they said they have quite a few ideas on how to be more involved in the community and give back. Though nothing is set in stone, French said they have considered holding benefits for community organizations such as Feed My People and The Community Table, and have even considered holding an ice cream bar once it gets warmer.